The makings of a really good chicken noodle soup can be argued until the end of eternity. Every culture adds their own flair. 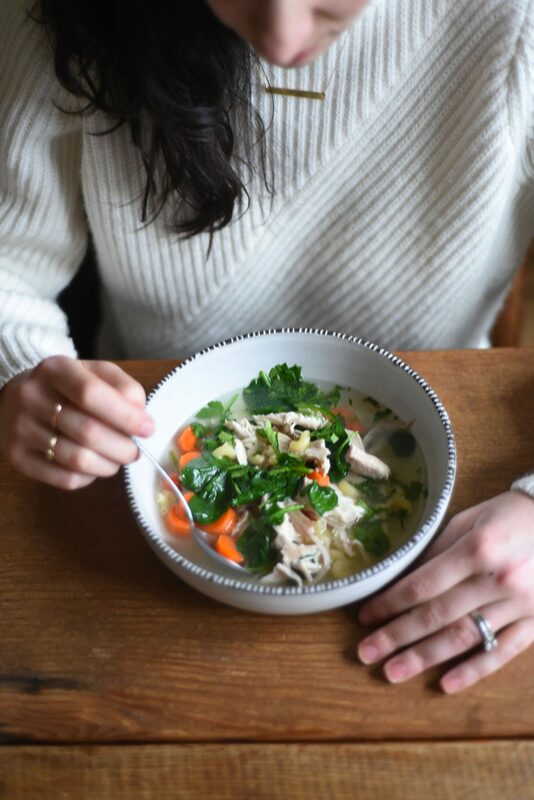 From egg noodles to ramen, lemongrass and ginger to egg, we’ve all grown up with our version of chicken soup, and the belief that it’s the very best. 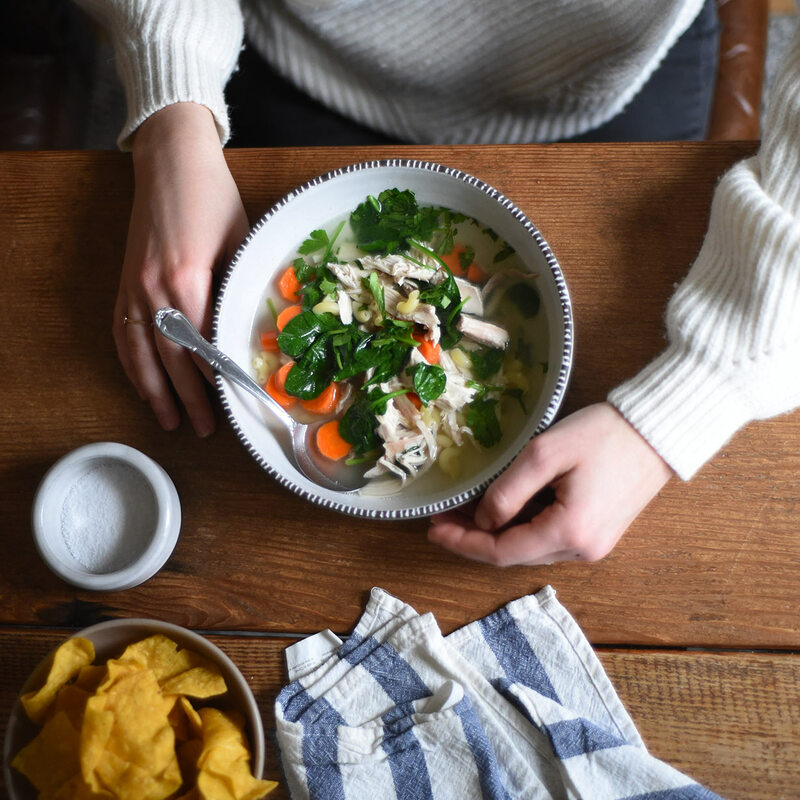 Over the last year, I’ve been making a lot of chicken noodle soup, but it only recently dawned on me that I should share my go-to recipe with you. Not because I didn’t think you’d like my chicken noodle soup, but because I just assumed that you’ve got your go-to recipe (presumably, your mom’s or grandma’s). In my family, chicken noodle soup is the cure-all for ailments of the mind, body, and yes, soul. My mom cooked up a batch for me after I had my first baby, which I devoured, in between sobs, lamenting the challenges of new motherhood. 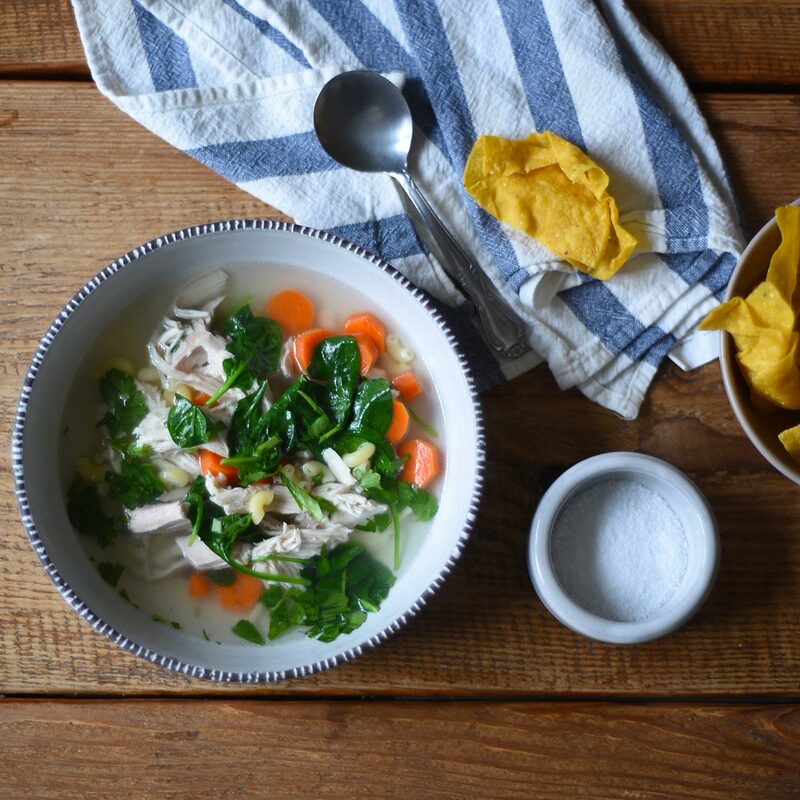 Now that I have three little people who are no longer babies, I often get requests for soup. 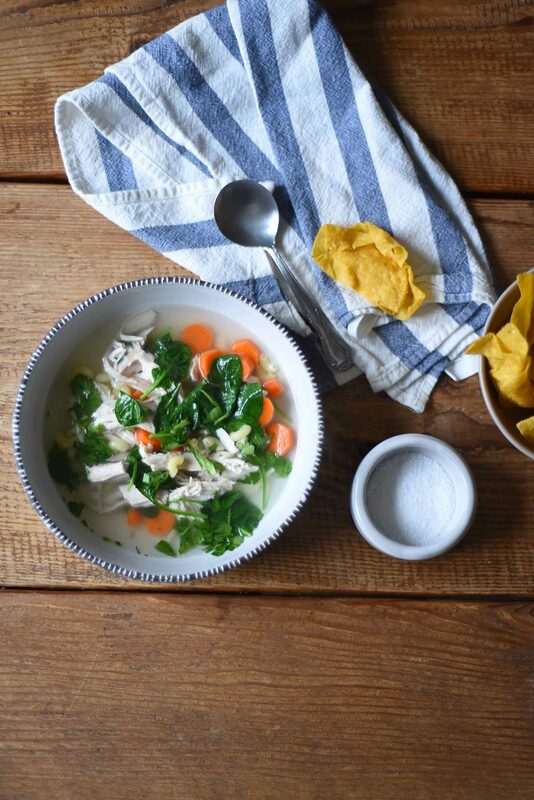 Chicken noodle soup, specifically. Of course, being three unique individuals, my kids all have their preference: Mila loves broth, Neko loves noodles (but not cooked carrots), and Noah…well, Noah has no special requests; he just eats. Matt and I almost always douse ours with Sriracha for an extra kick. But lemon juice works, too. I won’t lie: thinking about how I will feed three teenagers has kept me up at night. Funny how, just a few years ago, I was writing about my breastfeeding struggles (in the context of soup, of course). My, how quickly the time goes. This is when I dream of soup. Big, overflowing batches of soup leftovers. And my nerves calm a bit. Nothing says love like a pot of chicken noodle soup, simmering on the stove. My recipe changes slightly each time; in fact, last night I walked on the wild side and stirred in hominy. Other times, I’ve added chickpeas and cauliflower. And others, still, I’ve given it an Asian twist, using cinnamon and star anise, topping it with bean sprouts. Here’s the thing, though: once you’ve mastered the solid base, you can play around with a variety of spices, herbs, vegetables, and grains. 1. Add the chicken and vegetables to a large stock pot and cover with water. Stir in salt, to taste (I usually start with 1/2 a tablespoon and add more later). Bring to a boil, then turn down the heat to a simmer and cook for about an hour (until the chicken meat is fully cooked and begins to fall off the bone). Occasionally skim the fat off the top. 2. Remove the pot from the heat and carefully transfer the chicken to a carving board. While it’s cooling, place two layers of cheese cloth over a colander and place it over a large bowl. Strain the stock through the cheese cloth and toss the cheese cloth, along with the vegetables. Pour the stock back into the pot. 3. Remove the skin from the chicken then use two forks to shred the meat off the chicken and add the pieces back into the stock. Add in the sliced carrots and noodles. Bring the soup to a boil and season with more salt, to taste. Cook until the carrots are fork-tender and noodles are cooked through. Stir in the spinach, cooking for just a few minutes (until they’re wilted). 4. To serve the soup: ladle into bowls. Stir in parsley.